Get to know America's first law school. William & Mary Law School is one of five graduate and professional programs at William & Mary. William & Mary is the second oldest college in America. William & Mary was the first to offer professional education in law (1779). 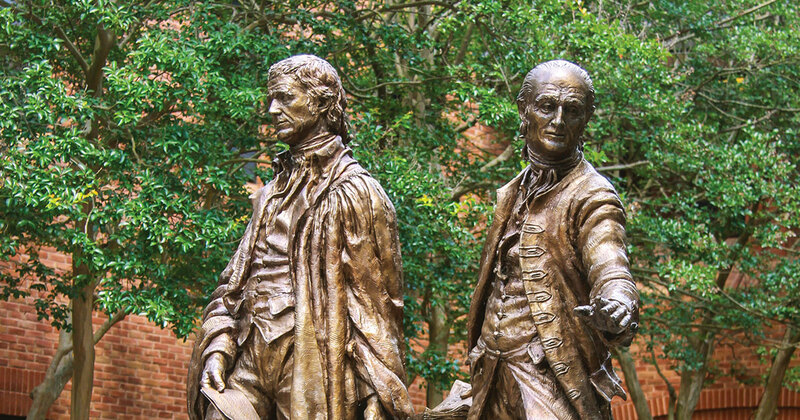 Three early American presidents—Thomas Jefferson, James Monroe and John Tyler—attended college at William & Mary. Jefferson went on to read law with George Wythe, a Williamsburg lawyer and one of the most distinguished lawyers in colonial America. Wythe became William & Mary's – and the nation's – first professor of law in 1779. William & Mary Law School is historically known as the Marshall-Wythe School of Law and has been accredited by the ABA since 1932. For more information regarding ABA accreditation contact: Council of the Section of Legal Education and Admissions to the Bar of the American Bar Association, 321 North Clark Street, Chicago, IL 60610, (312) 988-6738. The Wolf Law Library: The library has a collection of more than 400,000 volumes, vast electronic resources, and was designed with students in mind. Features abundant seating, two reading rooms, 12 group study rooms, and wireless Internet access on all three floors. Furnished, air-conditioned, on-campus graduate apartments with full kitchens. The Commonwealth of Virginia has a number of educational benefits and resources available to help active duty members of the military, veterans, and their families. For more information, please visit the Virginia Department of Veterans Services website at www.dvs.virginia.gov and the State Council of Higher Education for Virginia website at www.shev.edu. For information through the Veterans Benefits Administration, contact the U.S. Department of Veterans Affairs at www.benefits.va.gov or www.gibill.va.gov. Applicants to William & Mary Law School may also contact the William & Mary Veterans Benefits Officer (vabenefits@wm.edu) for more information.